Met Anitra Winje of Kootenay Career Development Society. 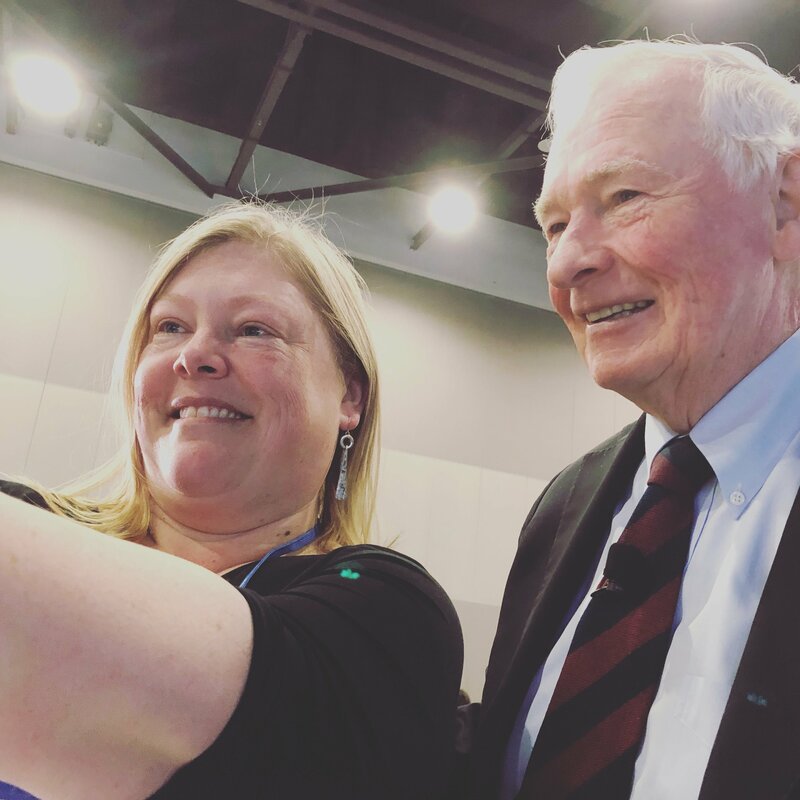 At right, she is taking an "illegal" selfie with Former Governor General, The Right Honourable David Johnston. This shot is in advance of his speech where they mentioned several times to NOT take a photo with Hon. Johnston. Attended a panel discussion called "Demographic Shifts, Big Data, and Predictive Models." It was fascinating to learn how LinkedIn and others are using data to overcome the challenges of inclusivity and to anticipate what is expected for the biggest employment shift in generations. Sharing of Open Data at a federal level is in the works. The federal Future Skills rollout is coming in the next few weeks. CCCBET has a representative position on the 15-person council but I can't disclose who it is until the official announcement after the Federal Budget. This council will come up with a strategic plan to identify Canadian priorities and the Future Skills Centre activities will focus on using evidence-based research to inform new initiatives. At the "It's Time to Get Decent: Advocacy in Action" session presented by the Canadian Career Development Foundation, we learned that job precariousness has increased 50% in the last 20 years. More can be found in their paper presented to the federal government. RBC launched the results of their study "Humans Wanted: How Canadian youth can thrive in the age of disruption" with links to online resources. The website rbcupskill.ca is designed to identify skills-based clusters then suggest career pathways. In the session called "Putting Values at the Centre of Your Leadership, Kofi Hope of the Wellsley Institute talked about knowing your own story and sharing it with others. He referenced the Simon Sinek TedTalk about finding your "why?". Congratulations to CERIC CEO, Riz Ibrahim, and his staff for putting on a timely and dynamic program!